The iPARK 6™ features provide highly efficient low glare lighting, extreme power savings, along with low installation and maintenance costs. The sleek profile, flexible design features, and simple mounting process make the iPARK 6™ a perfect choice for engineers, contractors and end users. Offering premium parking garage optics. Low glare from lens that delivers light to the ceiling cavity and high on walls. Great user experience. UnimoTM unique mounting systems allows installers to save time and cost in a difficult application. Enjoy fast ROI. Increase savings by adjusting light output automatically based on occupancy. front access panel allows for simple power splicing as well as (optional) occupancy sensor mount. The iPARK 5™ optical assembly consists of highly reflective specular aluminum die formed reflector along with semi-diffuse highly efficient PMMA injection molded lens. 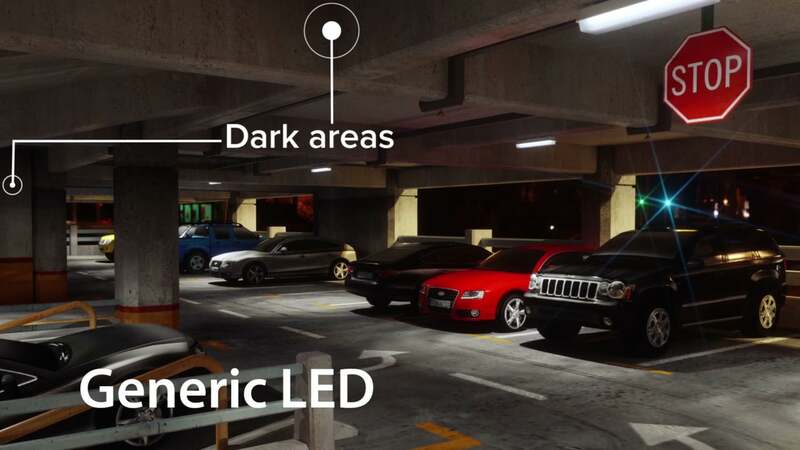 Light distribution is optimized to achieve high angle brightness on walls and between vehicles while maintaining visual comfort. For higher ceiling applications, downward throw optics are available. iPARK 5™ luminaires offer >95 Lumens/Watt; CRI >80; THD <10%; PF >99. Projected life beyond 100,000 hours. LED modules and drivers are offered with a standard 5-year warranty based on performance under normal conditions (consult warranty for details). NOTE: Specifications subject to change without notice. The fixtures and accessories shown here represent standard inventory product. Please consult J2 Light Inc.™ for custom build requirements. U-iPL Unimo™ Universal Mounting Bracket for fast installation in surface, ceiling and pendent mono-point applications. Disconnect provided on input power wires. The iPARK 5™ is cCSAus listed for damp locations and -40˚C to +40˚C ambient environments. RoHS compliant and LED modules comply with IESNA LM-79 and LM-80 standards. DLC approved.